Since we are so close to Blue Ridge, GA and Windy Valley Llamas, it would only make sense that we would find time to visit the place we workamped during the summer of 2012. So on Sunday Dec 8th, we left Townsend, TN and headed south to Blue Ridge, GA. Our route took us to Maryville, TN; then south on US411 to Madison and south on TN 68 through the south end of Cherokee National Forest. The Winter scenery of bare trees replaced the lush green forest we saw during the summer of 2012. Still the mountains are beautiful. We made the 105 mile trip in about 2 1/2 hours. We were excited to make this trip because when we left Windy Valley Llamas, we knew we were leaving life long friends there. We were warned in 2012 that the Blue Ridge Mountain area would call us back. They certainly did. After a chance to catchup on what has been going on during the past year, we had a wonderful dinner with Pam and Jerry along with their neighbors, Tim and Karen, and two other workamper couples. Monday morning we got up to visit the llamas. The two Great American Pyrenees dogs, who guard the llamas, did not have any problem with us coming into the pastures. It was apparent they remembered us. Our goal was to check out Sushi. 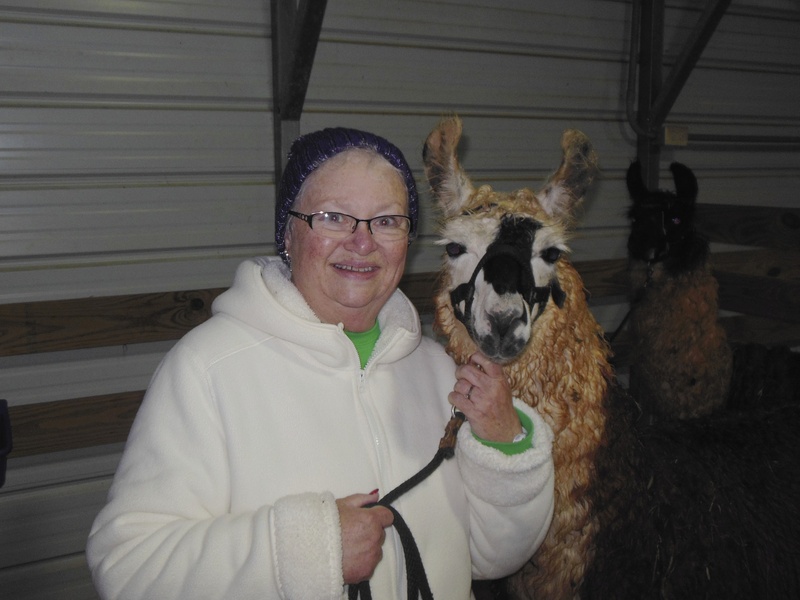 She was the llama that Carol help deliver in May 2012. In the photo on the left Sushi is less than 6 hours old and standing by herself. The fence in the photo is about 5 feet tall. Monday’s photo (below) of Carol with Sushi shows how much she has grown. I fell in love with Dior. 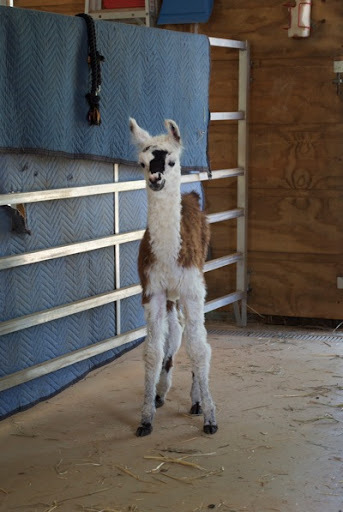 One of two rescued llamas Pam has added to the herd. She was very friendly and loveable. We had an enjoyable visit although it was too short. 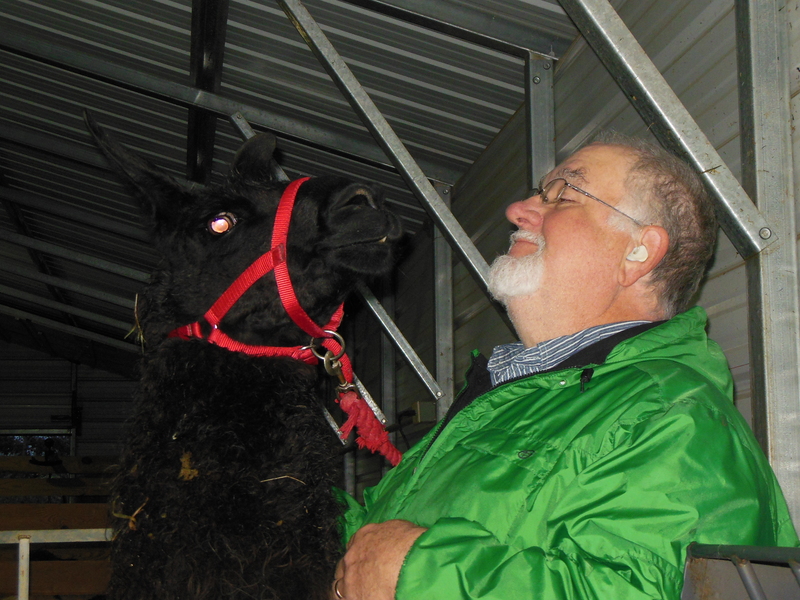 Working at Windy Valley Llamas was the best thing that we’ve done in the two years on the road. We love the Blue Ridge Mountain and all the waterfalls. As we headed back, we decided to take an alternate route (US-74, US-64, TN-40) that would take us past the Ocoee Whitewater Center. (Click the tag on the right to see that post). As we drove past, we noticed the water flow looked pretty strong. We turned back for a closer look. Sure enough, the Ocoee River was out of its banks. Only to serious kayaker would dare venture out on this river today. The two channels of water seen on the left of the following photo is a walk way along the edge of the river. Normally there would be more rocks on the right side of the photo where viewers can sit to enjoy the rafters and kayakers travel downstream. 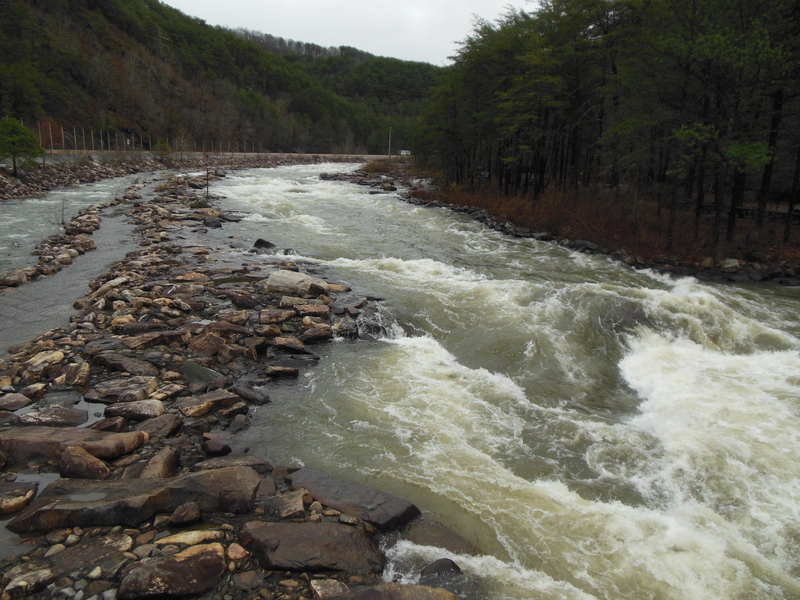 Further down stream at the Ocoee Dam #2, the water was pouring over the spillway. Normally the water barely trickles at this point since the flood gate that maintains the water level would be open. Today is a different story. Make sure your computer’s speakers are on to enjoy the sound. It is amazing to see this raging river turn into a quiet and peaceful scene down stream. Lakes Parkville and Ocoee had been lowered to accommodate the runoff from all the rain in the region. 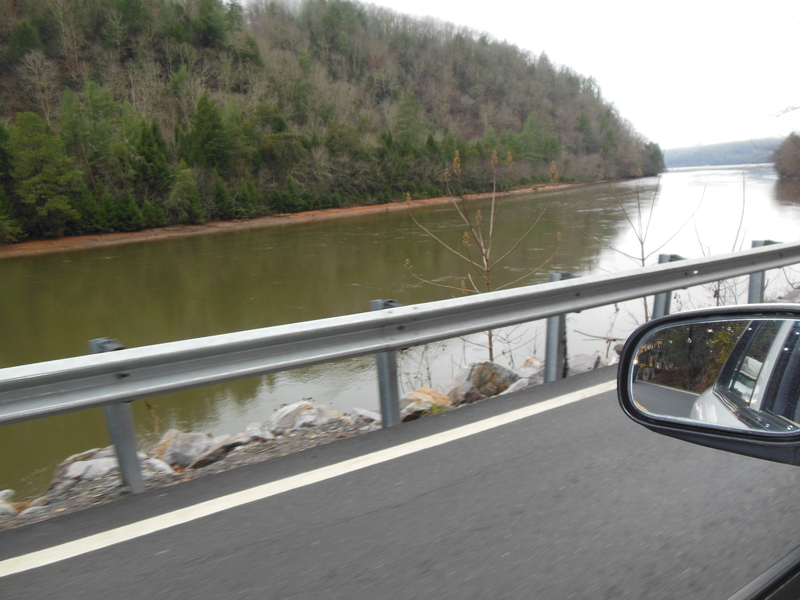 We turned north onto TN-30 to head back into the Cherokee National Forest. As we climbed, we drove past a few isolated homes buried in the forest. These folks wanted to be far away from the hustle and bustle of city life; they want peace and quiet; they wanted to be left alone. 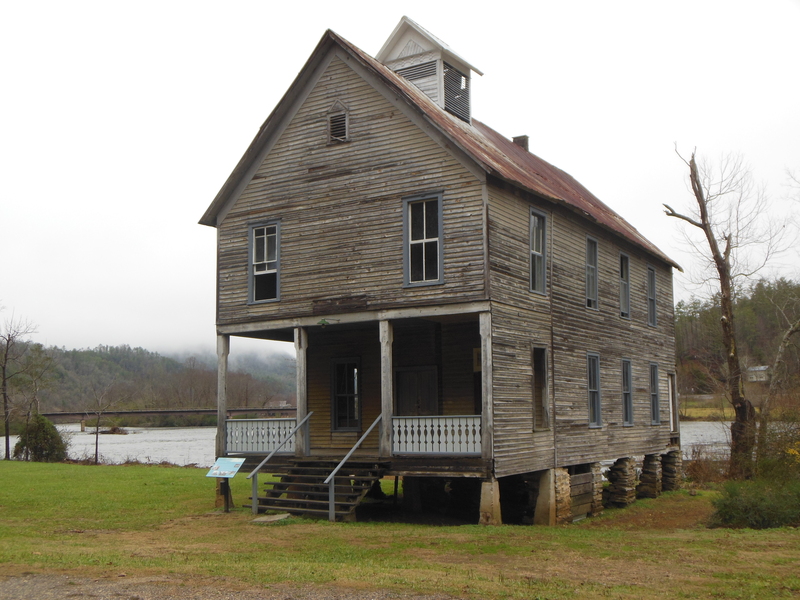 We next came upon the Hiwasee Union Baptist Church (founded in 1848) nestled on the banks of the Hiwassee River, The building was erected about 1899 through the joint effort of the Hiwassee Union Baptist Church and the local Masonic Lodge. This two-story, frame structure served as a community building. The upper floor was for lodge meetings while the first floor served as the church meeting hall. The first floor was also used as a schoolhouse for a brief time. We soon found our connection to US-411 and headed for home. 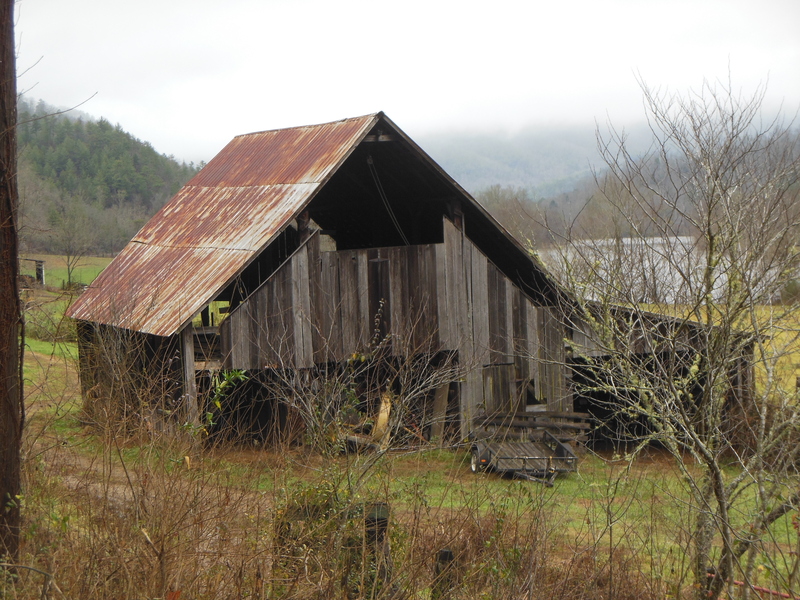 I leave you with yet another old barn. We love these old structures. If only walls could talk. This entry was posted in Georgia, Tennessee and tagged Hiwassee River, Ocoee Whitewater Center, Windy Valley Llamas. Bookmark the permalink.